Boston’s summer Restaurant Week started yesterday, which, if you’re not familiar, is actually two weeks when many local restaurants offer a prix fixe meal. Typically it’s the more upscale restaurants that participate, and with lunch prices set at two courses for $15, or three for $20, it’s usually a great deal. When I worked downtown I made a point to try one or two new places each time. Restaurant Week happens twice a year, and I wrote about the great winter RW meal I had at the Russell House Tavern here. Restaurant Week aside, prix fixe menus seem to be all the rage these days in general, especially those offering a beer or wine pairing. Many restaurants in our area are now offering a special two, three or four course meal for a set price, usually midweek. We’ve written about the great value Brewer’s Prix Fixe dinners we’ve had at John Harvard’s here and here, and we’ve also had a couple of very good beer-paired dinners at the Independent. Wine-pairing dinners are a bit harder to come by, so we were delighted to read about the monthly Harvest Review dinners offered by Harvest, in Harvard Square. 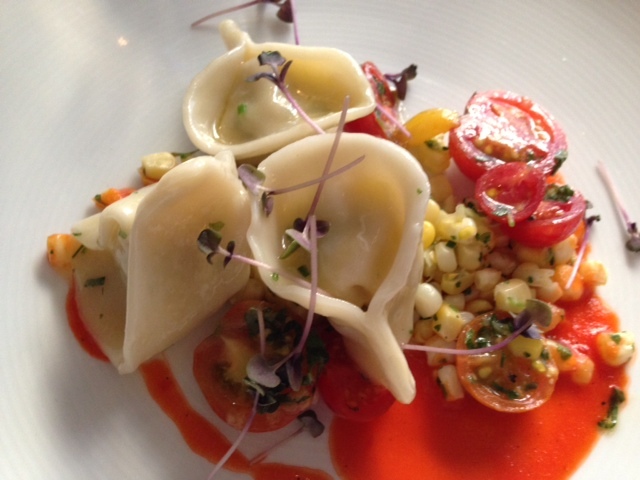 Tucked down a small alley off Brattle Street, Harvest is a lovely restaurant with great food. The chef, Mary Dumont, was named best new chef in 2006 by Food & Wine, and competed on Iron Chef America. Not an inexpensive restaurant, however, and although we’ve had drinks there a couple of times, I’ve only had dinner there twice before: once with a holiday work party, the second time during Restaurant Week last year with a friend. The Harvest Review dinner is offered once a month, on a Wednesday, and is a set four course meal with wine pairings for $44*. Perhaps not budget pricing, but for the quality of food, with wine, this was an amazing value. It’s no wonder the room was packed with at least 50 people. 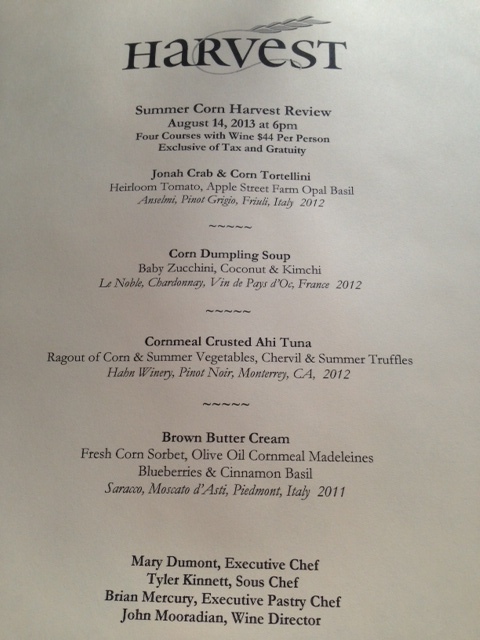 The August Harvest Review, held last week, was all about sweet summer corn. Everything we had was delicious, but I think my favorite was the first course: the crab and corn tortellini were very balanced, neither ingredient overpowering the other. 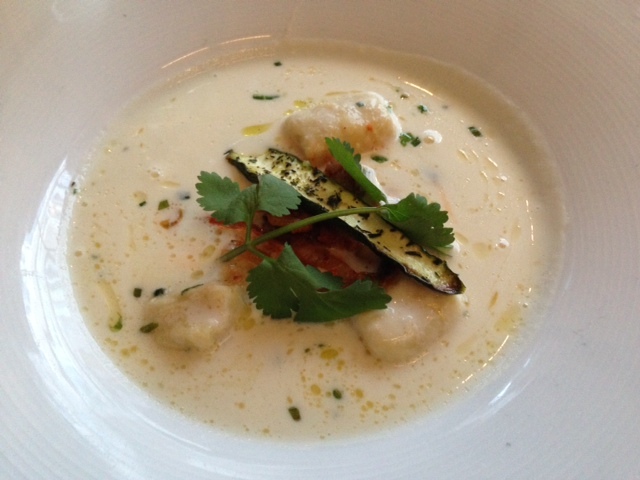 Or maybe the soup – in part because the wine pairing, a La Noble Chardonnay, was absolutely perfect with it. Actually, it was all very, very good, and full of corn flavor in the best way. 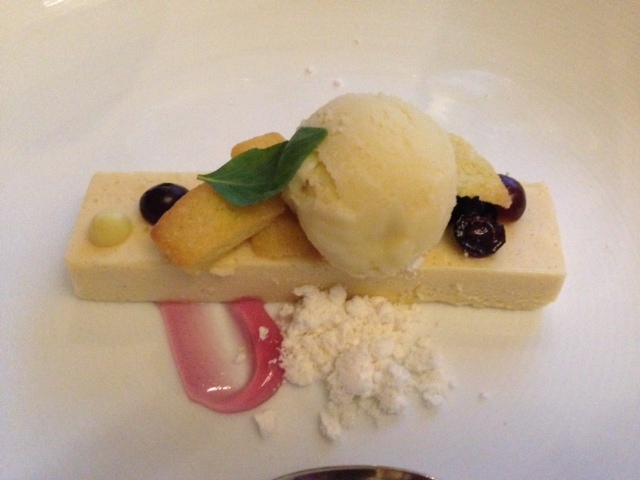 The corn sorbet really did taste of corn, and paired quite well with the white chocolate mousse. 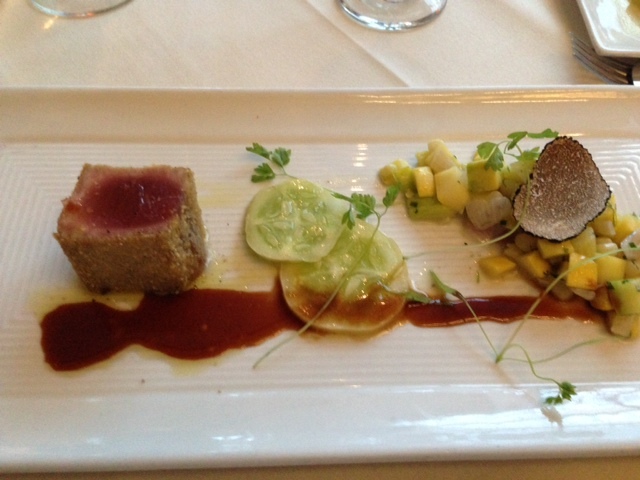 Mark your calendars: the next Harvest Review dinner is September 18. Rumor is the menu is Provençal. * For those not interested in wine, we noticed a couple of people having the meal without the accompanying wines, and we did see one gentleman ask for a beer-pairing option.